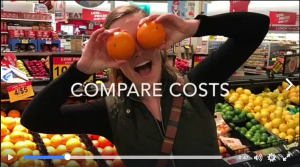 NIU Nutrition and Dietetics graduate students Kayla Droessler and Karen Jensen crafted this video as part of their NIU Campus Recreation internship rotation. They wanted a fun and entertaining way to share tips on the Campus Rec facebook page for how to make affordable and healthy choices while grocery shopping. It was shared on the It sure does look fun. Nice work!